Eurocom Corporation (www.eurocom.com), a developer of long lifespan, fully upgradable Notebooks, high performance Mobile Workstations and Mobile Servers is now offering the EUROCOM Leopard 2.0, a high performance 18.4” notebook with support for dual GPU operation. The EUROCOM Leopard 2.0 supports dual GPU technology from NVIDIA, as well as AMD. 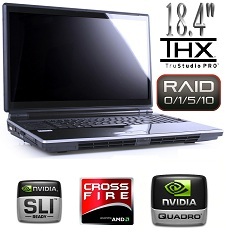 NVIDIA GeForce GTX 560M and AMD Radeon HD6990M and HD 6970M GPU’s power the Leopard 2.0. “This notebook is the epitome of mobile luxury computing, being the ultimate in mobile computing with not a single performance weakness” explains Mark Bialic, Eurocom President. With the 18.4” display and THX TruStudio Pro, the Leopard is a leader in mobile audio and video reproduction. Being fully configurable and customizable allows users to build their system to their exact specifications, operational and/or application requirements. THX Trustudio allows Eurocom customers to enhance the music and movies to make them sound livelier, enhance the sound quality and bass of any speaker system, and control the level of audio immersion in music, movies and games. Using NVIDIA GTX 560M GPUs the Leopard 2.0 can be connected to an external 3D display using HDMI 1.4a or DVI, a qualified 3D monitor is required. EUROCOM Leopard 2.0 is equipped with a picturesque 18.4” FHD 1920x1080p LCD display. Equipped with Auto Light Sensor technology, the Leopard 2.0 can smartly auto-adjust panel brightness depending on the environment. EUROCOM Leopard 2.0 supports up to 24 GB of RAM and Second Generation Intel Sandy Bridge i7 and i7 extreme processors, with the Intel HM 67 chipset. Such a high performance system also requires a redundant storage solution. The EUROCOM Leopard 2.0 supports 4 storage drives, for up to 4 TB in RAID 0/1/5/10. The EUROCOM Leopard 2.0 is a high performance professional, multimedia and gaming Notebook.